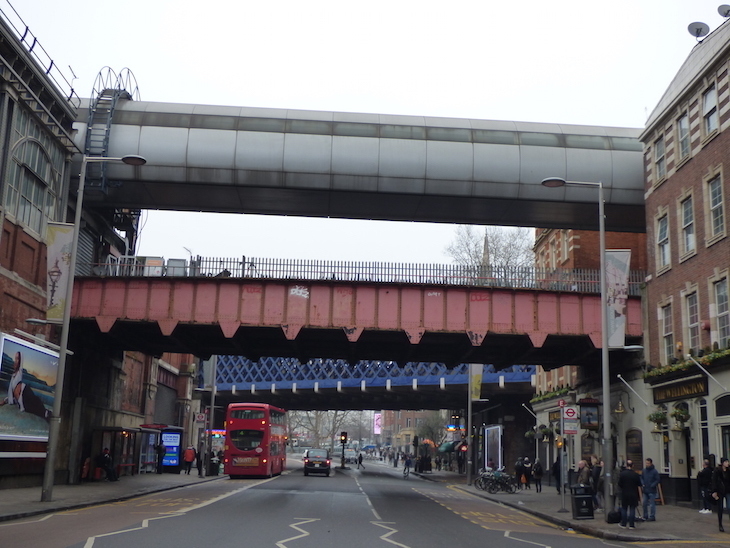 Where Do London's Mysterious Overhead Footbridges Go? 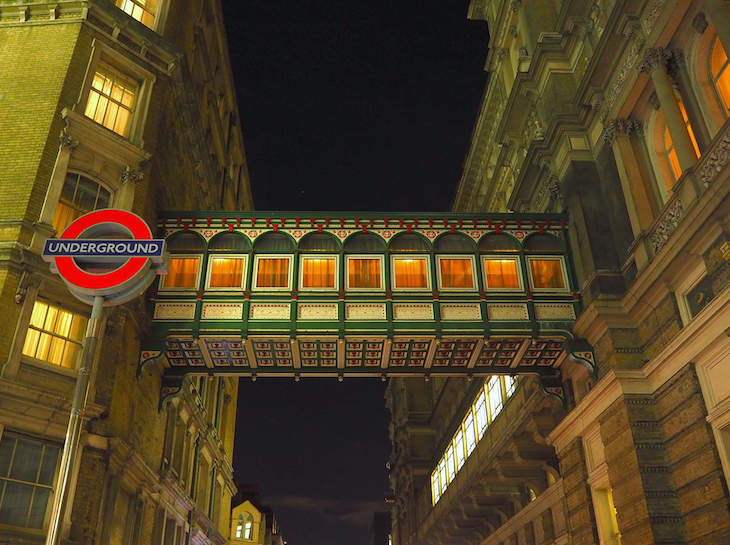 Laura Reynolds Where Do London's Mysterious Overhead Footbridges Go? Most bridges have an obvious purpose, such as transcending a road or railway line. It's the ones whose purposes aren't so clear that cause us an itch that needs scratching... we went investigating. 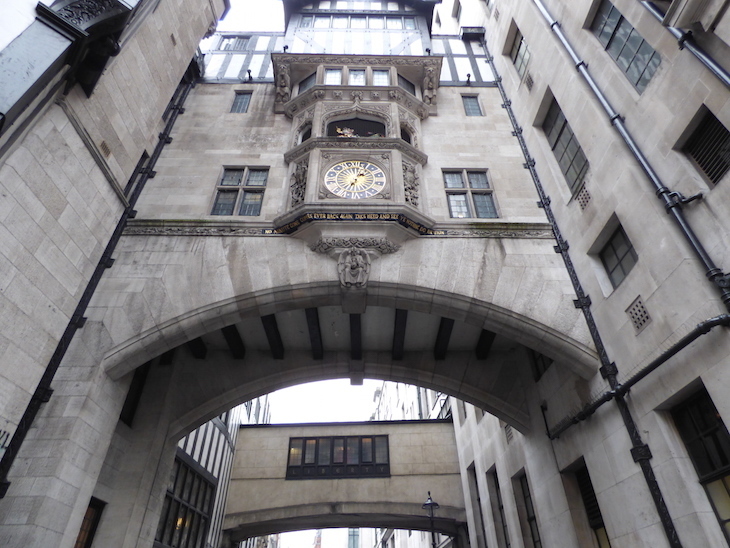 The footbridge pictured above stretches over Villiers Street between Embankment and Strand. 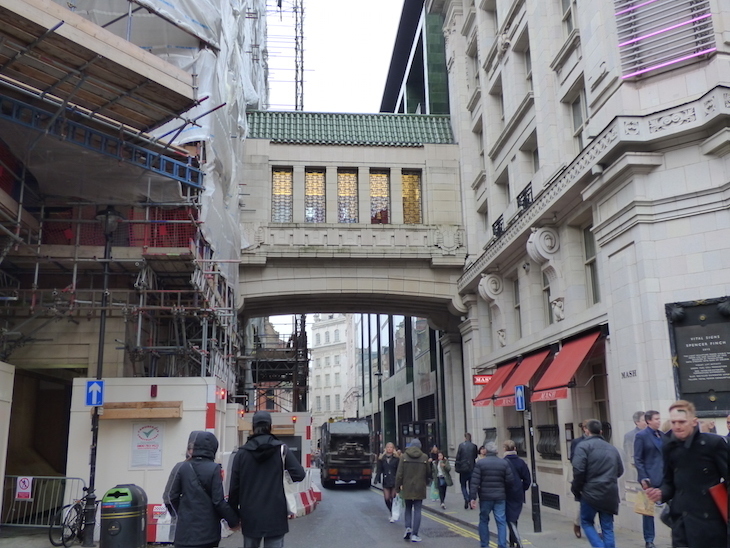 It was built in 1878 to join the extension of the Charing Cross Hotel (now the Amba Hotel Charing Cross) on the eastern side of Villiers Street to the original building on the western side, but there's little information available about the bridge today. From the outside, it's not even clear whether the hotel still owns the extension on the other side of the street. Liberty department store has not one but two footbridges built into it — although the three storey one in the foreground of the picture below is taller than plenty of houses, so we don't know if it legitimately counts as a bridge. The building on the left hand side of this photo is the main Liberty shop, and the one on the right is on Regent Street — the building where the Liberty empire began. The two bridges were added to the building at separate times. 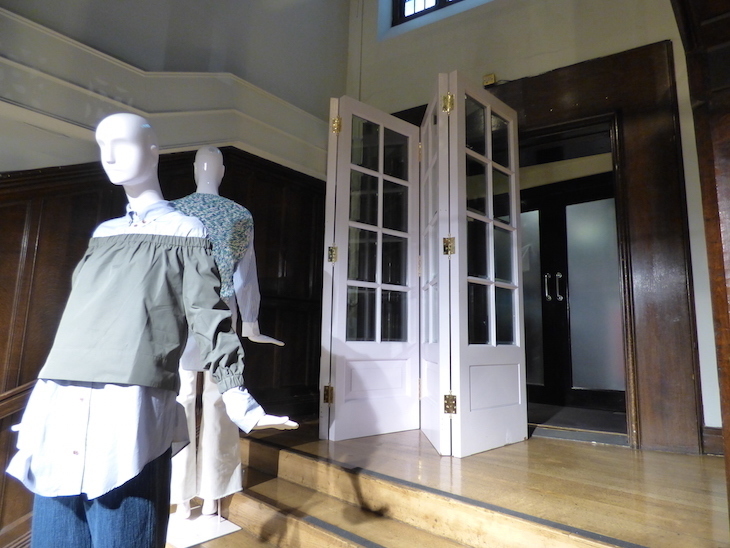 We asked Liberty about the bridges, but they never got back to us, so once again, we did our own exploring inside the store. Unfortunately the bridges aren't accessible to the public today (although we did see a member of staff using a keycard to access the three storey one, so they are still in use). 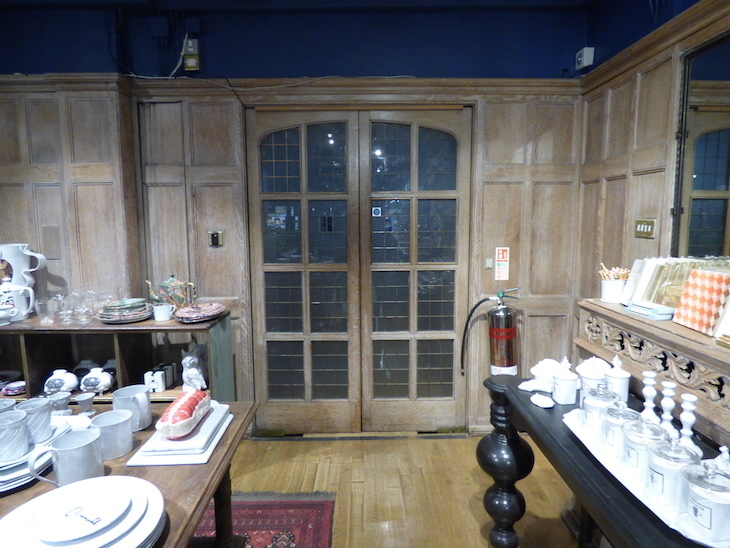 Enter the store via the door on the corner of Kingly and Great Marlborough Streets, head up to the third floor and you'll see this door in the corner — that's the door that leads onto the bigger bridge. 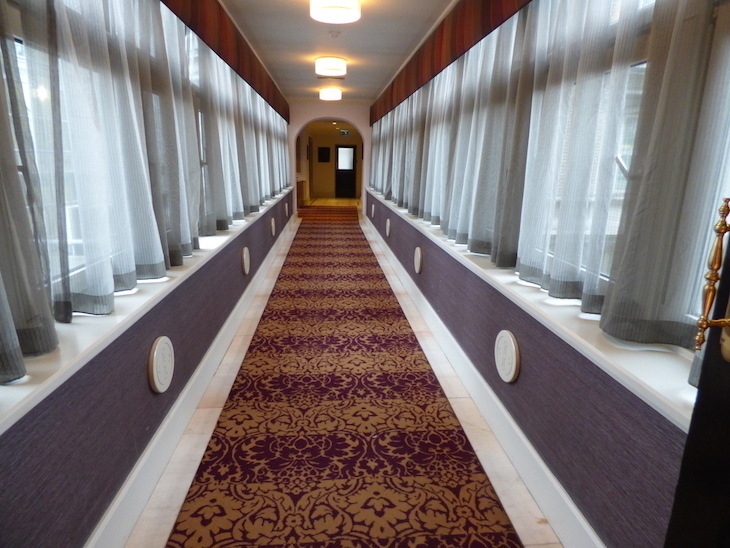 A similarly placed identical door one floor down also leads to the bridge. Go down another flight of stairs, to the first floor, and this time look to the left of the staircase. Behind this white concertina door is another door, which leads to the smaller of the two bridges. Again, it's off limits to the public. We've covered this one before. 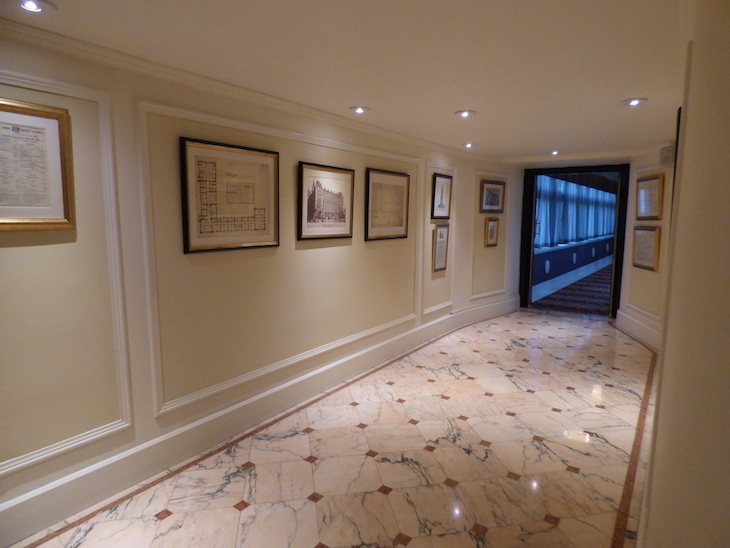 The bridge was part of The Regent Palace Hotel, the largest hotel in Europe when it was built in 1914, and linked the hotel to its laundry room and staff quarters. The hotel is long since gone, but the building, including the bridge, is Grade II listed. However, we can't find any information about who owns or uses the bridge today. What was once the hotel is now apartments, and the building at the other end of the bridge is ensconced in scaffolding at the time of writing. What we do know is that the bridge is in use — lights can be see on inside it. If you know what this bridge is, please solve the mystery in the comments below. The official name of this one is the Bridge of Aspiration, but we prefer to think of it as the twisty bridge. 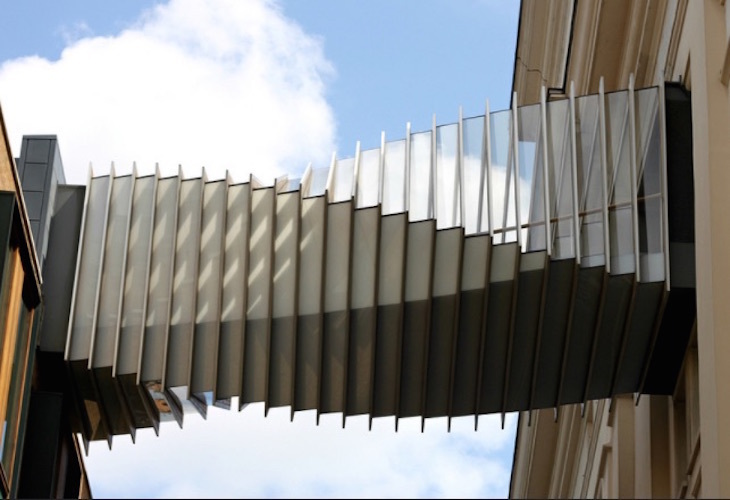 We always assumed it belonged to offices, but it actually connects the Royal Ballet School to the Royal Opera House (and for this reason, has also been referred to as the 'dancing bridge'). We love the thought of ballerinas pirouetting their way across it in tutus on their way to perform. Alas, it's not open to the public. It's a relative newbie to the London footbridge scene, designed by Wilkinson Eyre and completed in 2003. Here's what the inside looks like. To be honest, it reminds us of a rotating tunnel is a fairground funhouse. 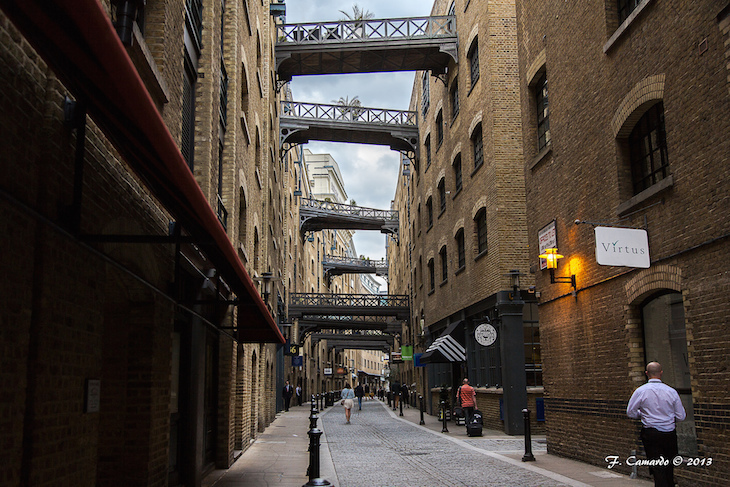 This former industrial area next to Tower Bridge has multiple bridges, criss-crossing above the cobbled streets. They date back to when the buildings were used as warehouses, and were for rolling barrels full of goods between different warehouses. Today, the ones which are in use are employed as balconies by the lucky devils who live in the apartments here. We've already ascertained that Waterloo and Waterloo East stations are practically in different postcode zones from each other. To get directly from one to the other, you have to use a footbridge elevated over Waterloo Road (the silver offering in the above photos). But below this tunnel — which looks like something Elon Musk could have designed — is another, slightly better-looking, if shabby, bridge, which used to join the stations, carrying trains from London Bridge to Waterloo until the 1950s. These days the bridge is used as storage space (although we can think of a better use for it). (The blue bridge in the background is the railway bridge carrying trains between Waterloo East and Charing Cross). Which bridges have we missed? Let us know in the comments below.